This list of the common American and European paper sizes includes the ISO standards, which are used globally. All dimensions are specified in inches, millimeters as well as PostScript points (1/72 inch, always rounded off). ISO page sizes – The ISO A series is the most frequently used page measurement standard. It includes the DIN A4 format. The ISO B sizes are used for poster printing while ISO C is meant for envelopes. The SRA standard defines press sheet sizes and is used in the printing industry. American paper size dimensions – such as ‘Letter’, ‘Legal’ and the ANSI series. English sheet sizes – with a focus on formats for writing paper and book printing. The A-series consists of a logical set of paper sizes that are defined by the ISO 216 standard. The largest size (A0) measures one square meter. The height/width ratio remains constant (1:1.41) for all sizes. This means you get the A1 size by folding an A0 paper in two along its shortest side. 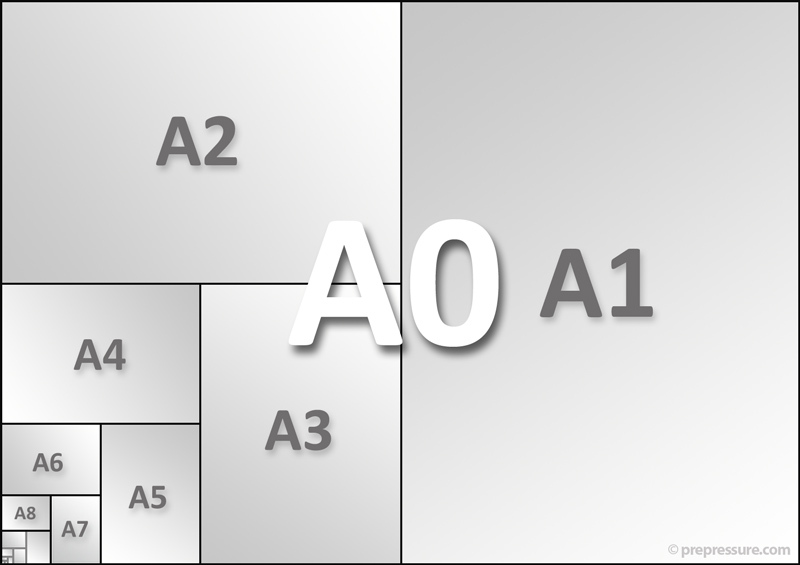 Then fold the A1 size in two to get an A2 size paper, and so on… A-sizes are used to define the finished paper size in commercial printing: A4 is for office documents, A5 is for notepads and A6 is for postcards. The same logic from the A-sizes also applies for the B-series, except here the starting point was the dimension of one of the sides, which starts at 1 meter. B-sizes are often used for posters. C-sizes are used for envelopes to match the A-series paper. I have omitted unrealistic sizes like C0 (imagine an envelope measuring 917 by 1297 millimetres). I have no idea what D-sizes are used for but the standard is there so it should be mentioned. These oversized papersizes are used by printers. The dimensions in millimetres are rounded to the nearest value. The US and Canada do not use the international standards but instead rely on the paper sizes below. The ANSI standard was added in 1995 to create a set of sizes that are based on shared dimensions. It lacks however the consistent aspect ratio of the ISO A-series. The English nowadays use the A-sizes for office and general use. I have no idea whether many of these definitions are still in use today. Imperial and half-imperial still seem to be widely used by artists. For books A-sizes often aren’t used because A4 is too large and A5 too small. Metric Royal Octavo and Metric Crown Quarto are 2 frequently used sizes that are more comfortable to hold and read.